FAQ: How Do You Receive My Orders? As an eCommerce fulfillment center, merchants are often curious how we receive orders from their shopping carts so that we can pick, pack and ship those orders from our warehouse to their end customers. It’s a great question! And the answer is that, at eFulfillment Service, we offer proprietary, web-based fulfillment technology, which we call our Fulfillment Control Panel (FCP), that not only allows our clients to keep a constant view of their orders and inventory, it also allows us to quickly and easily receive and fill their orders. 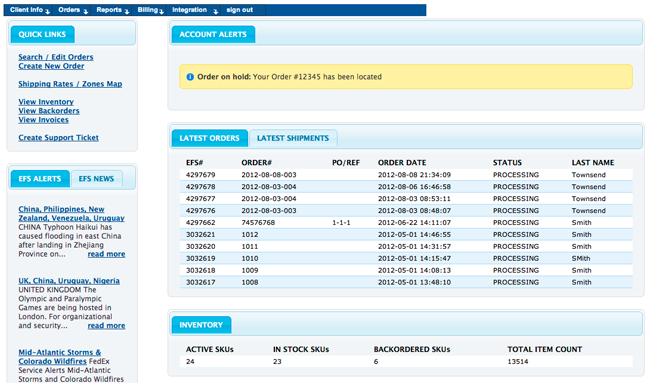 Our Fulfillment Control Panel currently integrates with over 30 shopping carts and online selling platforms. For many of those carts and systems, we are able to receive client orders automatically through the process of XML integration. We won’t get into all the technical mumbo jumbo, but basically, with this level of integration, when you receive an order, our Fulfillment Control Panel has a little conversation with your shopping cart so that we can automatically pull new orders into our system with all of the required data. In some cases, depending on our client’s shopping cart, our system will also send back tracking and inventory information automatically. Automated XML integration is the fastest and easiest way for us to receive orders, but there are certain shopping carts that don’t have the necessary interface for us to communicate this way. But fret not, because there are two other ways that we can receive orders. Many carts and selling platforms allow merchants to export CSV files of their orders. A CSV file is basically a standardized spreadsheet with certain fields for each order, including your customer’s name, delivery address, items/SKUs purchased, and the selected shipping method. That CSV file can then be easily uploaded to our FCP system, and depending on your order volume, you can upload new orders once a day or multiple times per day. Lastly, in the off chance that a client is using a shopping cart or platform that doesn’t allow for XML integration or CSV file exports, our Fulfillment Control Panel also allows for manual order entry. In this case, clients can log in to our system, 24/7, and input the required fields for each order. And just like with the two options outlined above, when clients manually enter orders, we provide real-time reporting to keep them in the loop as to when their orders have been processed and shipped. When deciding whether or not to outsource your order fulfillment, or when trying to determine which fulfillment house is right for your business, technology should be an important factor that you consider. At eFulfillment Service, we provide online sellers with fast, secure and accessible technology they can depend on, technology that is supported by an experienced in-house IT team and allows us to fill orders with over 99.9% accuracy. If you’d like to learn more about our FCP system and order fulfillment services, give us a shout. We’d love to talk! How Do You Receive My Orders to Your Fulfillment Center? As an ecommerce fulfillment center, we're often asked how we get orders from online sellers. In this post, we outline the 3 ways that we receive client orders.